Te Puia is a geothermal valley in Rotorua. It’s pretty famous, as it homes the Pohutu geyser, the largest active geyser in the southern hemisphere. 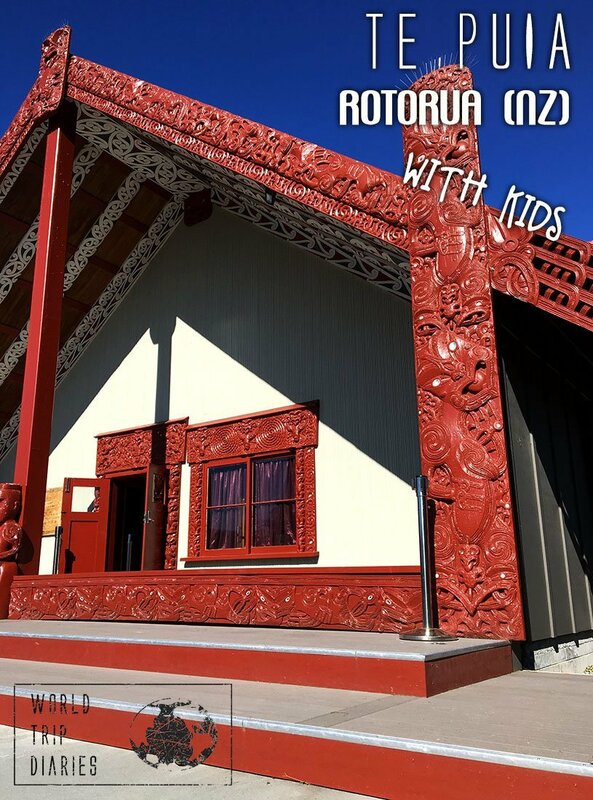 Here’s our review of Te Puia, Rotorua, with kids. We got there at a bit earlier than 11 am, got our entry tickets and performance tickets and entered. The first place we saw was the square with the 12 guardians or Te Heketanga ā Rangi. It’s pretty impressive, to see the wood carved faces all around us: the kids felt a bit scared for a bit, but it passed as we talked about them and read each guardian’s description. They are a bit scary to keep harm and threats away. The Pohutu Geyser erupting. It’s actually very big – and it happens once every hour or so! Wait there to see it starting to fill up until it actually does erupt! The guided tour took around 1 hour and it was very informative. It’s included in the entry fee so everyone can enjoy it. Our guide took to see the Marae (the 2 meeting houses and the storage house), told us about how Māori carvings were used to pass on their history, the language, and how they first came to NZ. He also took us to see the carving and the weaving schools – pretty cool, I must say. I loved to see how they work, even though I wouldn’t want to be there working and learning, with a huge amount of tourists recording videos, taking photos and looking. After that, we were taken to the erupting Pohutu Geyser, which was awesome! 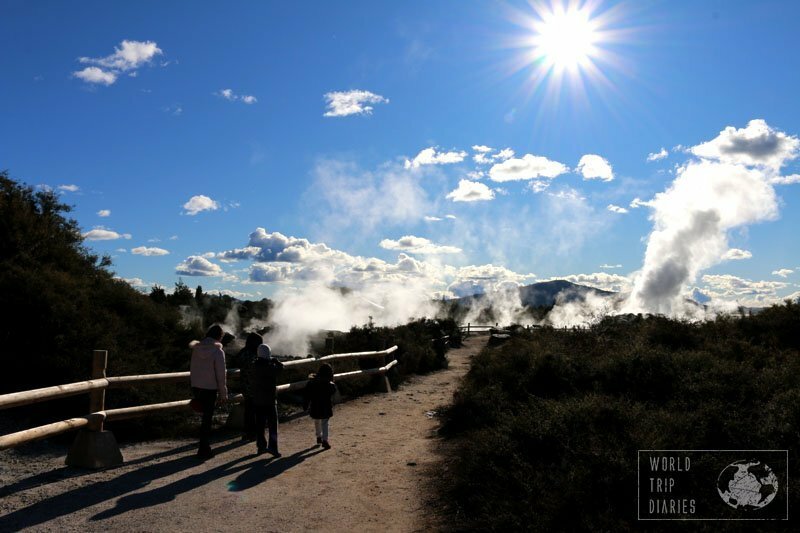 It was our first encounter with an active geyser, so we were in awe! We did have to run because we had our cultural performance starting at 12, so we didn’t linger. The cultural performance was my favorite part of the day. It started before we entered Te Aronui A Rua (the special meeting house). A tribe chief was chosen from the group of visitors, and we were greeted Māori way as his tribe. 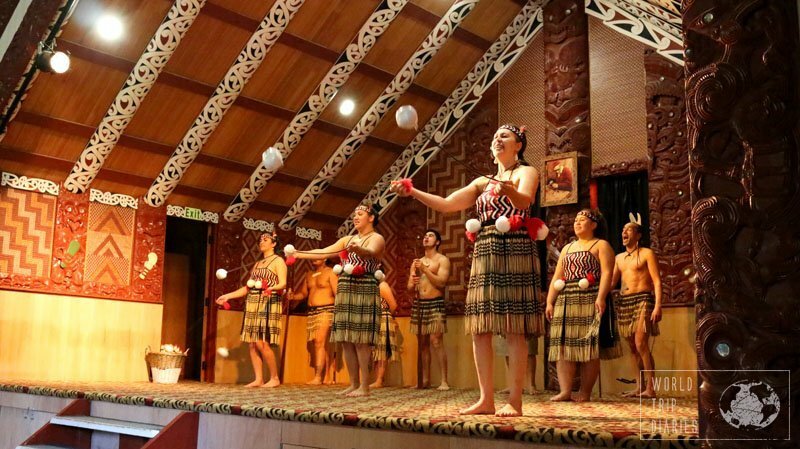 We were led into the meeting house, took our seats and they started the show, with songs, stick play, poi dance (a tennis size ball with a string), and the Haka. Poi dance, pretty cool – and very hard! It’s actually fun and easy to make, give it a try! It takes less than 1 hour, but very worth it. It’s beautiful from start to finish. I wish it would last for longer. In the end, they gave us some time to take photos with the performers – the kids didn’t want to, but Angelo did, and he had fun. 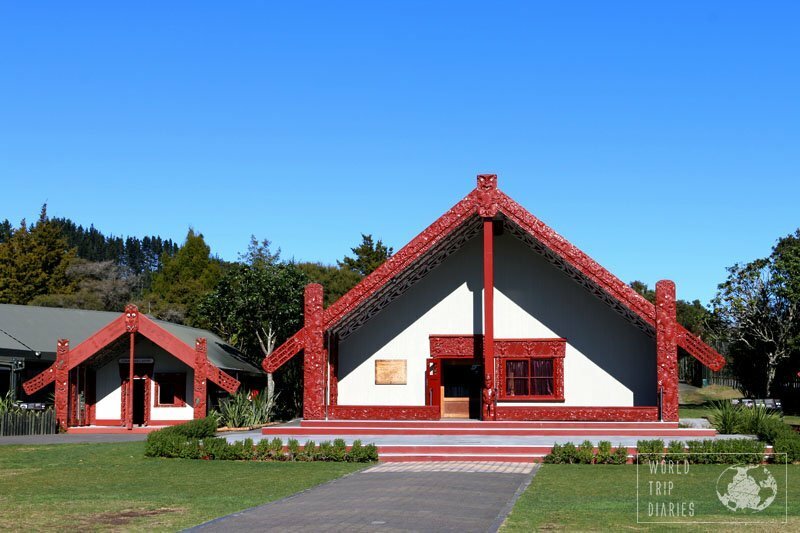 It’s a big place, there are lots to see and do besides the Maori show and the guided tour! After the show, we had lunch (we’d taken sandwiches) at one of the picnic tables and roamed around for a few hours. We all had lots of fun! It’s smelly, but there’s so much to see! My kids loved the fact that near the Pohutu geyser, the floor was warm. In some places, it was even hot – not burning hot, but hot enough so you can’t keep your hand for too long. I loved the geyser, of course, but the walk and the stories written around the place were my favorite. So much I didn’t know! It was also cool to see their natural oven, see the huge boiling mud pools, the super colorful ponds, and the smoking rocks. Apparently, it has a pre-European Māori village that we didn’t see, even though we did walk around a lot. We spent 6 hours there, so you can imagine the size of the place. The place is huge with well-established walkways – easy to walk, even for the littlest ones. We left the place at 5, tired, happy and full of new knowledge. It’s a really cool place, full of culture, life and study opportunities. It’s not cheap, but I believe it’s worth it! 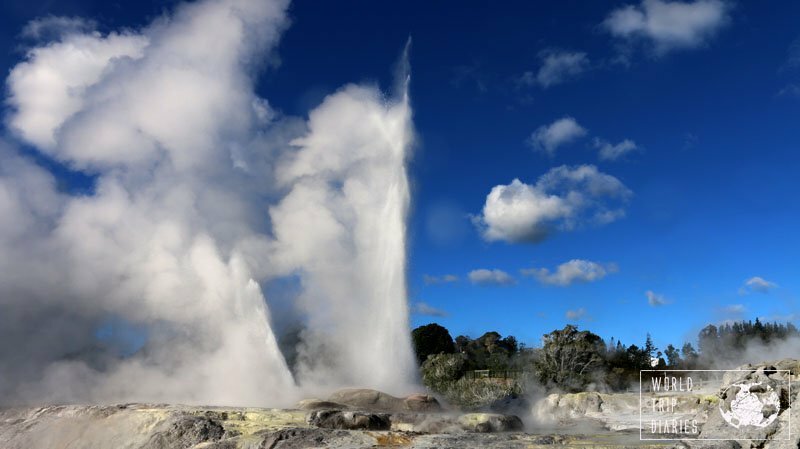 Our video about Te Puia. The highlights and the beautiful music sang by the performers. Have you subscribed to our newsletter? You should! We send out 3 postcards every month and I talk about a lot of things there!